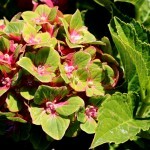 A compact, mounded shrub with deep green foliage. 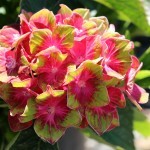 Mophead flower clusters are a unique combination of scarlet-red tinged with green and a blue eye. 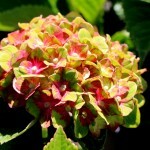 Blooms appear in late spring and will rebloom again in early fall with the removal of spent flowers. 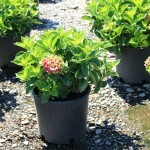 It prefers partial sun and moist soil. A Ball Ornamentals introduction. PPAF.